Valley of the Boom, the new NatGeo series, tells the story behind the rise of Silicon Valley. I’m so excited that the NatGeo series I executive produced and Matthew Carnahan created and wrote will finally be on your screens this Sunday. It’s the story of the first dot-com boom and Silicon Valley in the 90s, which was a tech version of the Wild West, full of amazing characters and personalities. This was the Big Bang of the tech world and Silicon Valley, before it settled into the more orderly universe we have now. 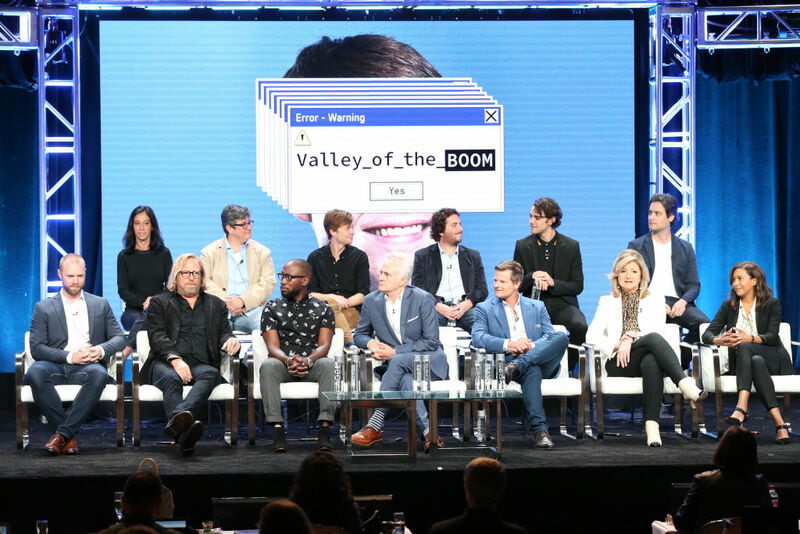 Valley of the Boom is how it was all created — and the stories are incredible. It was like a supercharged version of the American Dream. Some of the characters were geniuses, some of them were charlatans, and some of them were both. There was no playbook for how to do what they were doing. It was a literal gold rush, in the same place as the one 150 years earlier, except the big difference with this one was that you could create your own gold. And sometimes all you had to create was a good story of how you might create gold. And the decisions they made, the quirks of their personalities, their alliances, their feuds — all of that is still reflected in the Silicon Valley of today. And it’s beyond Silicon Valley — the stories of the dot-com bubble changed everything: technology, business, venture capital, how IPOs are launched. It’s the story of how nerds became rock stars and how a bunch of 20-somethings changed the world. Some of the stories you’ll see include how Marc Andreessen became the poster boy for the triumph of the nerds. He was the real deal in every way and his story is the wild, unlikely story of the web itself. He created an early version of Netscape while still in college and ended up on the cover of Time at age 24, sitting on a throne with the title “Golden Geeks.” And the browser itself helped form the web out of the Internet and make it navigable. It’s no mistake that the first mass-market version was called Navigator. And the browser then sparked something called the Browser Wars, a legendary decade-long fight between Netscape, under Marc Andreessen, Jim Clark and Jim Barksdale, and Microsoft and Bill Gates. And that fight has everything — huge stakes, backroom deals, accusations of treachery. Many of the issues it raised — about antitrust, about intellectual property, about innovation versus grabbing market share — are still incredibly relevant. It was also a lens into another current phenomenon — how the law can’t keep up with the pace of technology. Then there’s the story of The Globe, which was at the time the biggest IPO ever, going up over 600 percent on its first day. And then its crash was as spectacular as its fall. And, finally, there’s the absurd and surreal story of Pixelon, a startup that exemplified the excesses and the smoke and mirrors element of the web, which culminated in a notorious party in Las Vegas that cost $12 million. It was the story of the bubble in one night. Pixelon and David Kim Stanley are the culmination of the dot-com era in so many ways — when the hype and the fantasy narrative weren’t just hyping a product, they were the product. The founder is fictional, which is appropriate because the product essentially was, too. And the investor and the founder were both selling the other something that wasn’t really there. The dot-com boom was the ultimate FOMO: The train was leaving the station and you didn’t want to not be on it. But a lot of people got sold a lot of phony tickets. We were very lucky to get Jim Clark and Jim Barksdale on board. They both played the role of senior advisors and mentors to Andreessen and the young Netscape, but they’re also very different. Clark is this serial entrepreneur with great vision and an ability to see around corners. That allows him not just to end up creating three billion-dollar companies, but also to make incredibly timely investments in others, like Apple and Facebook. He’s there at every stage of the Internet — and still going. Jim Barksdale is the stately southern gentlemen who had a unique understanding of the power of the network. And his background was perfect to teach him about sending and delivering and accessing information, having been at FedEx, and then McCaw, which became AT&T Wireless. He somehow knew how to gain the respect of and lead a group of young tech pioneers into the world of big business, and he was also a forceful advocate for his team in the browser wars, especially when he went before Congress. This is a complicated story to tell — it’s about specific colorful characters with remarkable stories, but also the story of a time and a place and how a universe came into being. And Matthew is the perfect person to weave all of this into one coherent and compelling tale. He’s a fearless and deeply human writer. And in the spirit of the characters that he’s so vividly bringing to life, he’s done it in an incredibly innovative, rule-breaking way that’s never really been done before. And because of the skill of Matthew and the other writers and producers, most people are going to connect with it as sheer entertainment. It’s an incredible story told incredibly well. It’s less about technology than the deeply human characters at the heart of it. And even people who lived through it will see things they never knew about and can barely believe.